What were Voltaire’s main contributions to philosophy? 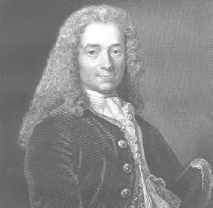 In his Letters Concerning the English Nation (1734), published as part of his Philosophical Letters, Voltaire introduced a French audience to the ideas of John Locke (1632–1704) and Isaac Newton (1643–1727). At the same time, he offered political criticism of the ancient regime, which was to motivate the French Revolution. Against Blaise Pascal (1623–1662), who in the previous century had counseled quietism and claimed that suffering on Earth was excellent preparation for heaven, Voltaire argued for the betterment of human life in the here and now. Voltaire’s “Letter on Mr. Locke” in his Philosophical Dictionary took up a possibility raised by Locke of matter being able to think. However, later in life, he retreated to a skeptical position on such materialism after it was taken up by the philosophes in defense of atheism. A witty playwright, poet, and essayist, Voltaire was a widely read French popularizer of Isaac Newton and John Locke (iStock).